A fixie with gears? Yep, public pressure has persuaded Sturmey Archer to come back out with their three speed fixed wheel hub. Get used to the 'many clashing colours' look. It's all the rage these days. The Felt Compulsion - now 150mm travel with 1.5 degree slackened off the head tube for proper 'big bike' performance. 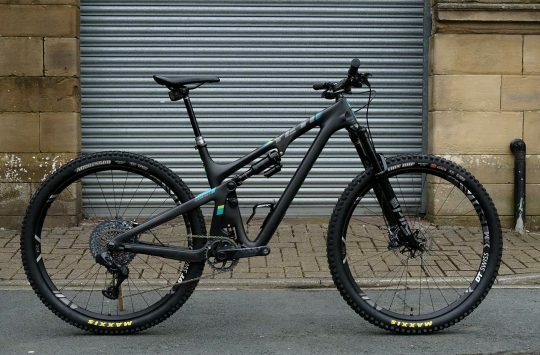 The Felt Virtue One - 25.5lb of XC fun - with redesigned tubing, an integrated gusset and some slick graphics. We can't help but love that graphic that goes right over the rocker. The company that applies the decals reckons they can only do five in a day as it's so complicated. And if you wonder why Felts now look quite snazzy, it's because they've poached the graphics guy responsible for the fantastic Lapierre range. 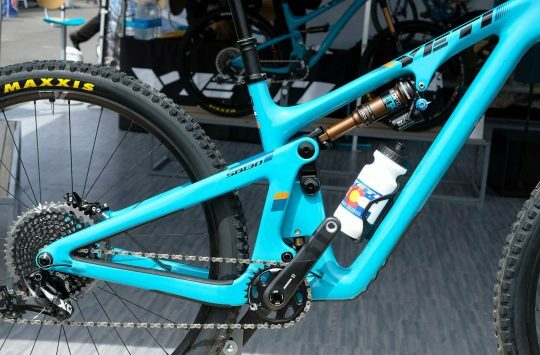 Another look at the Yeti ASR 5 - which we first showed you in our Eurobike coverage. A five inch XC bike? Or a light all mountain machine? Up to you. Salsa's new drop bar for 'cross and adventure bikes - super wide (the flat bit is 46cm) with a really short drop, it should find many fans. It's called the Woodchipper and comes in normal and oversize. Not a new Surly Endomorph tyre (though there is one of those) this is actually a 24in monster cruiser tyre fitted front and rear to a normal Surly 1x1. They did say they were versatile machines, didn't they? Spotted on most of the Intense bikes - an SLX level direct mount front derailleur. Now you have a choice. Now that's a pretty carbon seatstay. And it's from Titus. The Titus FTM was introduced last year - how about this brand new Titanium one? To our knowledge (feel free to prove us wrong) this is the first flared 1 1/8th-1.5in headtube that's been done in titanium. Another flared tube, this time on the Carbon Ftm - still with 5in of travel. Under down-tube rock bash plate for the carbon. The same Ibis Mojo HD that we brought you from Eurobike. It's been stripped of its Stars and Stripes decals and remains a proto, though we're off to see Lopes' World Champs bike in the show hall tomorrow to see how they differ. A detail that was hard to make out in our Eurobike coverage - the back end of the 160mm Ibis Mojo HD has a Maxle rear axle. Just for Singletrack member bent_udder - a shot of the Kona Magic Link Cadabra bike up close. The bikes at Eurobike were bolted to backings with the drive-side outwards, so it was impossible to get in close. Here you are! Chopper aka Greg Randolph with the new gold mirror Serpico shades. I wouldn’t call that top bike’s colours clashing. Pretty subtle and classy compared to the CMYK trend which seems to have hit hard. Is that Sturmey Archer three speed hub really a fixed wheel hub, or three speed freewheel hub? Bream – yep, 3 fixed speeds. They had it on display at London Cycle Show last year iirc. What is going on with that magic link? madness! Another Woop for the Mojo HD, especially as it’s got a rear Maxle. I imagine that it’s one very cool bike. The FTM – I like.